West Palm Beach Fire Rescue Assistant Chief Brent Bloomfield spent one week at the State of Florida's Emergency Operations Center (EOC) in Tallahassee before, during, and after Hurricane Michael. Bloomfield, who is also the City's Emergency Operations Director, worked as a liaison between the State EOC and the Urban Search & Rescue team. 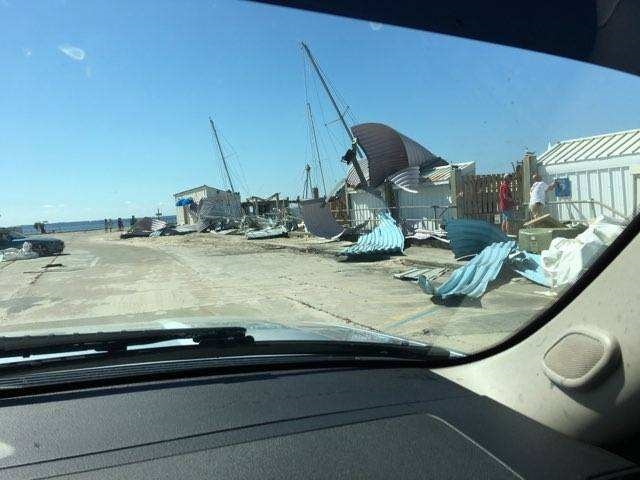 He also spent time in Mexico Beach and Panama City, areas hit hard by Hurricane Michael. "If there is one key takeaway that I can share from this experience with our residents, it's the importance of evacuating in the event an evacuation order is issued during an emergency," he said on Friday from the City's EOC located at Fire Station #5 at 700 N. Congress Avenue. Bloomfield, who returned to West Palm Beach on Friday, says he witnessed first hand the destruction of storm surge, when--during a survey of hurricane ravaged areas-- he discovered the water line some 30-feet above sea level on the third floor of a Panhandle home just a couple blocks from the beach. There are still several weeks until November 30th, the official end of the Atlantic hurricane season. And though the frequency of storm development and chances of a storm strike continue to wind down with each passing day, Chief Bloomfield says the aftermath of Hurricane Michael serves as a reminder of the importance of preparing to be self-sufficient for up to 72-hours in the event of a hurricane or other emergency. Meantime, the City has ramped up its support of our neighbors in North Florida. Last week, Department of Public Utilities technicians and operators, supported by members of the City's Fleet Maintenance team, dispatched to the Florida Panhandle to assist in the relief efforts for Hurricane Michael. The Utilities technicians and operators are working to restore water and sewer service in Bay County, an area hit hard by the hurricane. They departed from the City Complex with backhoes, Bobcats, generators and other heavy equipment. Mayor Muoio and City leadership were there to send them on their way and wish them a safe return. 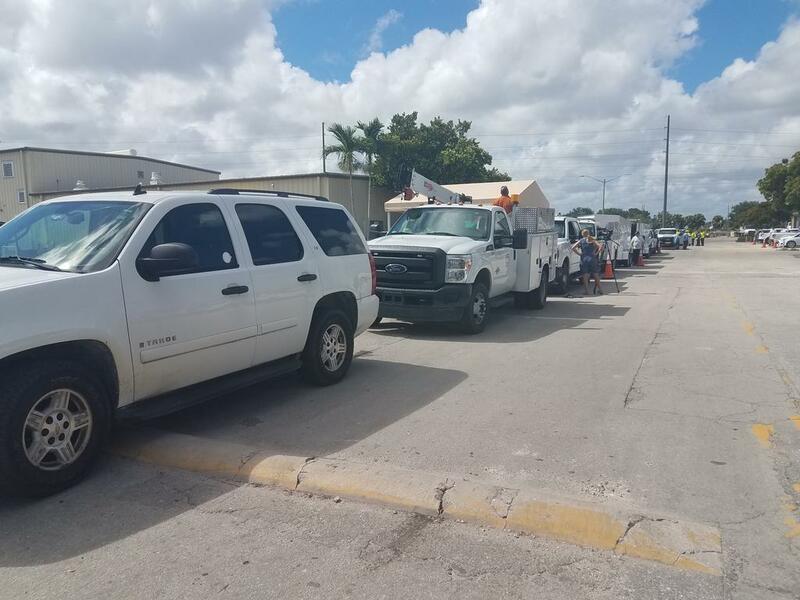 The City's public utilites relief effort is being coordinated in conjunction with FLAWARN, Florida's Water/Wastewater Agency Response Network, the formalized system of "utilities helping utilities" to address mutual aid during an emergency, led by Asst. City Administrator Scott Kelly. The City is committed to helping our neighbors in North Florida and, to date, has deployed a total of 32-crews of whom three have returned. "Seeing people come from all across the state to help after Hurricane Michael was so heartwarming," said Bloomfield. "It's an honor to help, and we know they will be there for us, should a major storm strike here." Mayor Jeri Muoio and the City of West Palm Beach will recognize Unity Week 2018 from October 21, 2018 through October 27, 2018. Unity Week 2018 is a campaign for unity in the community and, also, in support of local radio personality Reggie Dee, who is walking from West Palm Beach to Seattle, Washington to raise awareness of the importance of unity. Unity Week is being coordinated by Regi Taylor, principal, of Maryland-based Golden OpportUNITY FOR UNITY, Inc. in association with X102.3 and Alpha Media Palm Beach. Mayor Muoio will officially declare the week Unity Week with a proclamation at a meeting of the City Commission at City Hall located at 401 Clematis Street on October 22, 2018 at 5 p.m. Unity Week was inspired by Mayor Muoio’s 2017 declaration of West Palm Beach as a City of Kindness encouraging everyone to conduct random acts of kindness and, also, by Reggie Dee’s walk across the country. On August 11, 2018, Reggie departed from West Palm Beach’s Currie Park on a 3,300-mile journey across the country to bring people together for a positive cause. TO CONTINUE READING, PLEASE VISIT:http://www.wpb.org/News-Video/Archive-News/MAYOR-MUOIO,-CITY-OF-WEST-PALM-BEACH-TO-RECOGNIZEs://walkforunity.com/. The City of West Palm Beach hosted a ceremonial ribbon cutting ceremony at Dreher Park on Wednesday, October 17, 2018. Mayor Jeri Muoio, Members of the Dreher Park Neighborhood Association and Parks and Recreation Advisory Committee, as well as participants in the South Olive Afterschool City Program participants joined us for the celebration of the new replacement playground on the south end of the park located near pavilion 3 on Dreher Trail South. The new playground features a rubber safety surface and a shade covering over the entire structure. It is now open to the public. The replacement of the playground kicks off approximately $700,000 in capital improvements for Dreher Park. In the next eight months, improvements will be made to the restrooms and fitness equipment and will include the addition of Disc Golf. The improvements are funded by the City’s Public Works Bond Fund and General Fund. Thank you to our residents who joined us to celebrate! FOOSA = Major Fun for WPB Kids! FOOSA (Fun Out of School Activities) is more than fun and games. It's a program for elementary and middle school aged children that provides a safe, activity filled environment at City Community Centers from 3:00 p.m. - 5:00 p.m., Monday through Friday. Children can participate in sports, arts and crafts, clubs and enrichment activities. Register at any City Community Center or at the City of West Palm Beach Parks and Recreation Department located at City Hall at 401 Clematis Street. For questions, call: (561) 804-4900. ABOUT: The City of West Palm Beach will participate in the national Read for the Record campaign on Thursday, October 25, 2018. The City encourages residents to take the time that day to read a book aloud to their own children or family members to encourage a love of literacy, books and family together-time. City leaders and employees will also take time to personally read to children at City recreation centers, local elementary schools, the City's downtown library and at many of the faith-based child-care centers. 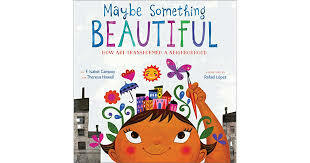 This year, we will be reading the book, Maybe Something Beautiful by F. Isabel Campoy and Theresa Howell and illustrated by Rafael López. This is a wonderful story about how a splash of color can change a community of gray. Based on the true story of the Urban Art Trail in San Diego, California, Maybe Something Beautiful reveals how art can inspire transformation and how even the smallest artists can accomplish something big. Pick up a paint brush, and join the celebration! The Mandel Public Library of West Palm Beach has many copies of this year's book available at the library and copies of the ebook accessible in cloudLibrary. We encourage parents and caregivers to come in and check the book out! On the day of the event, the library will have a craft project to accompany the book, as well as a place for families to sit down and read the book together. CONTACT: Lisa Hathaway, Mandel Public Library of West Palm Beach; (561) 868-7787 or email hathawayl@mycitylibrary.org. 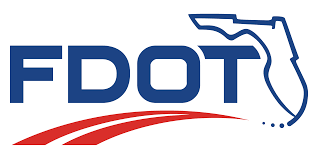 The Southern Boulevard Temporary Bridge, Flagler Drive and Southern Boulevard may be closed for brief periods between 3 p.m. and 5 p.m. from Monday, Oct. 22, to Saturday, Oct. 27, and from Monday, Oct. 29, to Friday, Nov. 2, as load testing is performed on test drill shafts south of the temporary bridge. The duration of the closures will be approximately 10 to 20 minutes and will occur on Flagler Drive from Flagler Promenade North to Harbor Towers & Marina Condominiums and on Southern Boulevard from Washington Road to State Road A1A/South Ocean Boulevard. For more information, contact FDOT: http://www.fdot.gov/. Spruce Ave. between 34th St and 32nd St. (through Tuesday, October 30, 2018): One side of Spruce Ave. will be closed alternately for curb, sidewalk and driveway replacement. Flaggers will assist motorists within the work zone. Rosemary Ave. at Gardenia St. (through Friday, October 26, 2018) will be closed for utility duct work. Detours provided, and traffic maintained on Evernia St. and Fern St. throughout the construction period. Clematis by Night (October 25, 2018, 6:00 p.m. - 10:00 p.m.): Road closures on N. & S. Clematis St. between Narcissus Ave. and Flagler Dr., and Narcissus Ave. between N. Clematis St. and Banyan Blvd. GreenMarket (October 27, 2018, 6:00 a.m.- 3:00 p.m.): Road closures on N. & S. Clematis St. between Narcissus Ave. and Flagler Dr., Narcissus Ave. between Banyan Blvd. and Clematis St., Lantana Ave. between Banyan Blvd. and N. Clematis St.